After you create a MySQL database, the next thing you will most likely want to do is to fill it with data. To do that, you need to setup tables. If you are installing a content management system or other type of script with an installer, it will probably create the tables for you. If that is not the case, you must create the tables yourself. While creating them from the command line is not terribly difficult, using the phpMyAdmin web interface is probably the easiest method. 1. Login to your phpMyAdmin installation either through your control panel or directly. 2. On the left, click the database you want to manipulate. 3. 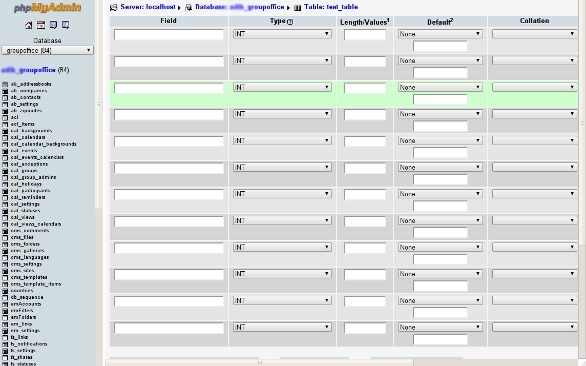 At the bottom, underneath the current tables, find “Create new table on database” and enter the name and number of fields each row will have. 7. Set the type of collation, essentially the encoding, such as UTF-8. 8. When you have all of the information inputed, scroll to the bottom and click “Save”. With that, you are all finished with your first table.